Game bar is one of the excellent features available in Windows 10. Using Game bar, you can record games, take screenshots, broadcast games and do much more without the help of third-party applications. With default settings, while running a game or an app, you can use Windows logo + G hotkey to open the Game bar. The Game bar can then be used to take screenshot of the app, record screen, and broadcast app. All these functions or features of Game bar can be accessed using keyboard shortcuts. If for some reason, you are not happy with one of the keyboard shortcuts assigned to Game bar or its functions, you can change it without the help of any additional software. 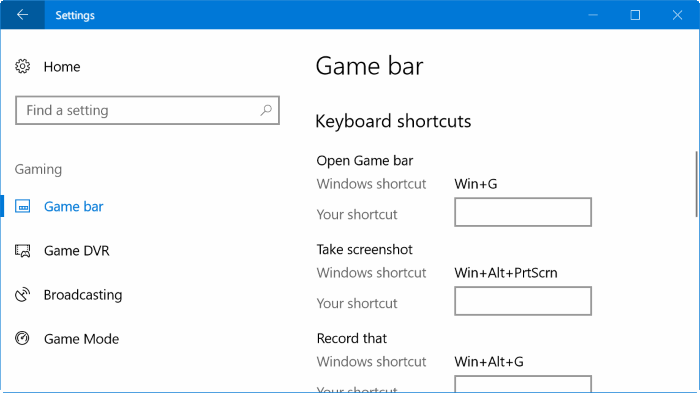 As you likely know, Windows operating system, usually doesn’t allow you change default keyboard shortcuts but Microsoft has made an exception this time by allowing to change default keyboard shortcuts of Game mode and its functions. You can change the default keyboard shortcut to open the Game bar, take screenshot, record screen, start/stop recording, show recording timer, turn microphone on or off, start/pause broadcast, and show camera in broadcast. Please bear in mind that Windows 10 doesn’t allow you set a keyboard shortcut which is already being used by one of the core features of Windows operating system. For example, you cannot assign Windows + R keyboard shortcut to open the Game bar as it’s already being used to open Run command dialog. The new keyboard shortcut which you want to assign to open Game bar or one of its features must include Ctrl, Alt, or Shift and at least one another key. Complete the given below directions to set your own keyboard shortcuts to open Game bar and other features of Game bar. Step 1: Open Settings app. Navigate to Gaming > Game bar. Step 2: Here, in Keyboard shortcuts section, select a field next to a feature, type your own keyboard shortcut comprising of Ctrl, Alt, or Shift and at least one other key. For instance, to launch the Game bar, you can set Ctrl + Alt + D hotkey.